Thanks to Nola and Sugar for Hosting the Blog Hop! Every now and then you need to just sit back and relax!! We've been doin' lots of the smae thing here too Ruby! Same here! We had to stay home today, because mom went to a baby shower. We think that Airedales should be invited to baby showers...c'mon! I like doing lots of that sometimes. I hope it is nicer for you tomorrow. I am just catching up and wanted to tell you how much I love working with for the donut pawty. I am glad you liked my truck, we can be a great pair with "Donuts and Rita's". I love you Rubes and always enjoy doing things with you. We need a girls night out soon. Donuts and pizza on me, if you could supply some type of beverage. We know the feeling! Add really cold to that description as well, and that's us! It's been snowing like crazy around here and it is almost too deep even for us to play in our yard so we have been doing lots of that too. Hey Ruby ...it's Ruby, your friend with the broken toe ...don't you worry I won't be on the side lines very long. In fact, my assistant can't seem to keep me still. I don't want to miss any of the fun even with my injury. How about we go grab some burgers! I think it's the first time you've ever said that you had bad weather! Come visit us - it's been like spring here! Windy & rainy calls for exactly that. Oh I am glad to see you are resting up after the tough week you had on rodent patrol! Those little frisky things can drive you crazy. Get some beauty sleep so you can look gorgeous at the dance. Put me down on your dance card please. Yeah, snoozing is about the only way to pass a rainy day. Looks like ya needed a margarita. Or two. Or three. Crikey Ruby ...... Sorry about the rain but .... fair dinkum ..... that photo is something else??? Beautiful, Ruby ...... just BEAUTIFUL!!!!! That's the best place to be! Wordless Wednesday - The Blue Box is Back! Auf den letzten Drücker. FROHE OSTERN! Little Cat Lost . . .
Have a Hoppy & Safe Easter on a #FiveSibes #SiberianHusky Flashback Friday! Absent for 87.000 years . It's our Crufts ticket giveaway time again! Sisterly Love on the Rocks ~ Wordless, but OH so Scenic! HELLO FROM THE BEACH! WE'RE SAFE! Kim Kardashian Ain't Got Nuttin' On Me! The One and Only Doc! 6 Months Sure Goes Fast! Wordless Wednesday - Birthday Celebrations!!! A day in the life of a partner of a dog besotted person. I'm 6 months old today!!! Has It Been This Long Already?? Have You Followed Me on WordPress Yet? Life with Wrigs: hike, play, eat, nap! The Dance Bar is OPEN! 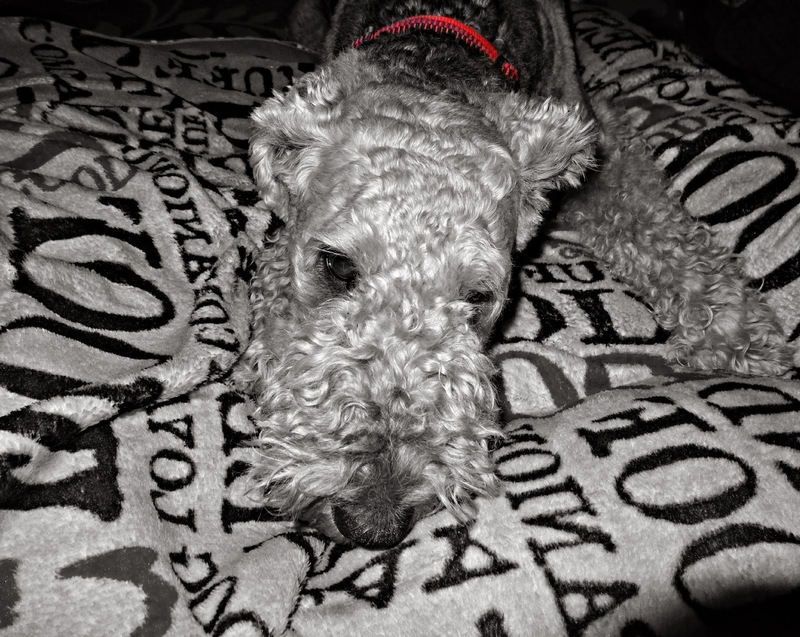 I am an Airedale terrier who lives in the Sf Bay Area with my mom person (Mama for short). I am 4 years old now, and I am a "chatty Cathy" my mama says. I just have to say what is on my mind - what's wrong with that, I tell ya? !